Understanding human psychology is essential for those developing marketing tactics. 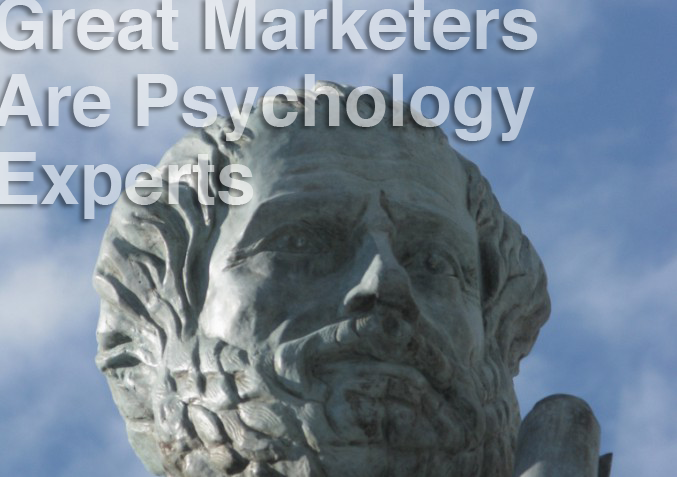 Without a doubt, great marketers are psychology experts. We employ various methods to entice the masses to purchase our goods and services. Because human beings are so complex, marketing is anything but a black and white process. It’s beneficial, therefore, to study the philosophical geniuses who have outlined the psychological principles of human instincts. In the entire history of humankind, few thinkers have offered more insights than Greek philosopher, critic, zoologist, and physicist Aristotle. Aristotle outlined how each of these seven motivators spurs sentient beings to act. By examining them through a marketer’s lens, we gain powerful information about how and why people take action. A call to action is possibly the most crucial element to any great marketing campaign. The next time you’re ready to craft a brilliant marketing campaign, use one or more of Aristotle’s causes to action, and see for yourself if this Greek brainiac was in fact the first marketing guru. Marketing is not an exact science. No matter how much we prepare, comb through piles of related research, and test our selling instincts, there’s a huge element of chance to every executed tactic. Aristotle, however, instructed that in order to transcend the uncertainty of chance, you must create a favorable set of circumstances to offset the randomness. In other words, we are responsible for doing everything possible to ensure success. What this means in the world of marketing: leave no stone — or channel — unturned. Don’t assume that what worked last year will work again this year. Test your assumptions. Keep current on trends. Commit fully to high-quality content. Hire top talent. This concept emphasizes that “random acts of marketing” don’t give you the best odds for success, and are therefore a waste of your time and resources. Instead, only launch well-documented and researched strategies. You still aren’t guaranteed to hit the mark, but by being methodical and meticulous, you’ve taken some of the power out of chance’s ability to thwart your plans. We all have an instinctual place — our “true nature” — from which we make our decisions. The more that calls to actions align with these instincts, the more likely people are to follow them. This applies to marketing wisdom in many ways. A deep awareness of human nature, or what makes us tick, can do wonders for marketing metrics. This is why it’s so crucial that you have an in-depth understanding of your core demographic. If your brand appeals mainly to women with children, their core traits are things like protection, nurturing, and family values. If you launch a campaign that does not embrace these principles, and you’re not likely to see much success. This is a very, very big one for digital marketers. People are irrational, impulsive creatures. Marketers capitalize on this every day by enticing the masses to make rash purchasing decisions. Social media campaigns (when successful) hinge on this notion. If you make it easy for people to take action, they are exponentially more likely to do so. Make it irresistible to “like” your Facebook posts. Ask your readers to share content with the click of a button. Simplify your calls to action, basing them in raw human emotions, and you’ll greatly increase the numbers of those who actually follow through. You’ve heard the expression a thousand times: Humans are creatures of habit. Appealing to this sense of the familiar is another wise way to engage your audience. In marketing terms, we first do this by creating a consistent brand experience. If you launch a campaign that goes against the traits your demographic expects from you, you are almost guaranteed to see it bomb. People don’t want to be surprised in marketing. They want what’s expected. Habit is especially essential for retention marketing tactics. If you’ve already gained someone as a customer, don’t change the way in which they connect with you. Consistency is pure gold. Remember that the next time you want to launch a website redesign or want to change the tone of your content marketing. Make changes gently and slowly, and only after you’re certain they’re in line with what your audience really wants. Reason connects with the marketing concept of value proposition. You have to appeal to a person’s sense of reason in order to entice them to take action. Folks won’t buy anything from you without thinking it’s best to do so. This often comes from an emotional response, which is a paradox. If you are savvy about explaining the benefits of a given action to your audience, you’ll see much higher results. Don’t just ask your customers to do something for you, tell them why it’s in their best interest. Now we’re really getting into the emotional side of things. People love to be motivated by their emotions. If you are aces about appealing to people’s emotional core, you will see them take action in surprising ways and numbers. So many great advertising campaigns are based solely on emotions. Brands like Coca-Cola and Petco use raw human emotion to create loyalty and connection. Get people passionate about supporting you and your products, and you can literally have a customer for life. We are a social species; seeing other people happy elicits happiness in ourselves, and it is therefore vital that all communications, no matter what the message, make the generation of happiness their key aim. As marketers, it’s our job to know what our customers desire, and to make them believe we are selling them what they want. Many brilliant marketing campaigns create a deep sense of longing and need that plays on this core concept. Convince people they really want what you have, that it will truly make them happy, and you are off to the marketing races. We can’t buy fans and we can’t schedule our commercials into the consciousness of our fans. Rather, we must speak with clear intent and respect the boundaries of the relationship. Thanks, Aristotle, for a good foundation. Now it’s our job to make these concepts work for our brands.